My grandpa died on my 13th birthday. I was too young to understand that it was going to happen, even though he was sick for about a year prior to that. He was in his early 60s, and much too young to leave us. And even though I still feel that I know him too little, there are certain things that make me feel like I know him quite intimately. There are certain things that no matter how adults try to hide, little children notice and are able to interpret later when they grow up enough to understand what was said, or what was exchanged in glances between overprotective parents or secretive relatives. Old Spice to me is one such key to reach out to these memories and reconnect with his never-dying spirit. 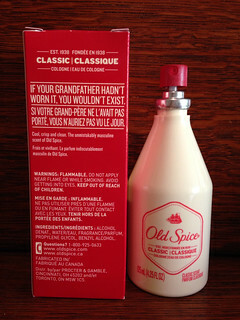 Old Spice was launched when my grandfather himself was 13 years old. Maybe he worn it for his Bar Mitzvah, though I highly doubt it: life in Israel/Palestine under British Occupation was very frugal. My grandmother told me that back in those days, his family had only two sets of clothes - weekday work clothes, which were washed and hang to dry every night, and another white shirt of Shabbat. That's it. Two years later, when my grandfather was a mere 15 year old boy, World War II erupted. Assisted by his sister, the eldest in the family of boys (like myself) he forged his age to 16 so that he can join the British Army and fight the Nazis and their allies, mostly in Italy. In 1944, he joined the Jewish Brigade and continued fighting Mussolini's fascist army all the while also saving Jewish survivors and refugees who escaped the Nazis, and helped smuggle them to Israel/Palestine and other safe lands. I doubt that there was a spare moment for dousing oneself with Old Spice in those days of war, and my grandma's recollection also does not include Old Spice until after they married. So perhaps the saying is true - and if it wasn't for Old Spice, my aunt and my mother would have never been born, and neither would me and the rest of my brothers and cousins. SmellyBlog would have never existed, along with many other things - some good ones and some not so great. It's really hard to tell without entering a time machine, isn't it? But what I do know for sure is that if it wasn't for my grandfather, I would know nothing of Old Spice, or men at all. I remember his bottle of Old Spice aftershave standing in my grandparents' bathroom. I was puzzled by the ship and sails on the bottles, and what does it have to do with spice, anyway? I was just as intrigued by it as I was by my grandmother's flacon of Shalimar, whose faceted blue stopper I would look through at the now-distorted blue world... To a girl who lived in a wild village with a stepfather that looked like Blackbeard himself, and a mom who never bothered to shave her legs or armpits or anything (not that she needs to, really) - the ritual of shaving was truly an exotic thing. I would wonder what is that bottle made of (its opaque shiny white glass looked like porcelain to me); how to open that bottle, and years later, when I finally did - I found the scent surprisingly familiar and comforting. It reminded me of traveling to London with my grandparents and visiting ancient ships and museums. It reminded me of sharing a hotel room with them that looked just as the hotel in Charade looks like, and marvelling at how late the light is still out in the summertime. Just as it is now as I type this in another Northern city - in Canada. My grandpa always made a point of shaving every time before he visited us, or if we came for a visit. He was travelling a lot, and must have been deeply hurt when as a little toddler I would recoil from his face if he had as much as a day-old stubble. For a little child this feels quite unbearably rough. He was such a considerate person that he kept this habit even though I grew up and overcame this sensitivity (to some extent...). And he continued to shave for me every time I was allowed to visit him in the hospital, in that agonizing, tragic year in which he was fighting pancreatic cancer and I was watching my baby brother who is ten years my junior in Tel Aviv all summer. Years later, that very brother, who my grandmother says looks so much like my grandfather did in his youth, inherited the Old Spice bottle from the oldest brother, who inherited it from our grandfather. My little bother was the only one who really adopted that fragrance as his own. And when he ran out, he found more in Canada when he was living with me. He was 21 years at the time, and had worn it deliberately and enthusiastically in every form available – eau de toilette, after shave, body spray, deodorant, soap, you name it. It made the whole house smell like Old Spice and when he went through the whole ritual so to speak we were both sedated by all the clove and allspice in there. 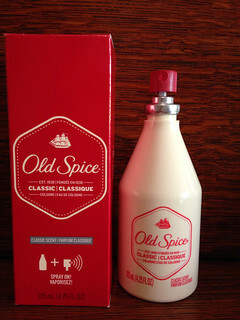 As I write this, I occasionally sniff my wrists, which are carefully doused with Old Spice's newest packaging (which you can see in the photos). It is no longer a splash bottle, but a spray of the cheapest kind. But I still like it. The writing is all in red, and so is the boat - which is much smaller. But the bottle still manages to stay true to its opaque white design - but not it is most certainly plastic of a creamy white rather than the bluish-grey milky white of yore. The scent is heavy yet heavenly. Familiar yet fantastic. Comforting yet seductive. What first comes to nose is cloves and allspice. So no wonder why it's called "Old Spice", right? Mystery solved! It's also sweet and carnation-like. A true spicy-oriental of the grand type. Yet there is also something very uncomplicated about it, which makes it so wearable and delicious. For a scent so inherently associated with barbershop and masculinity, it's a bit surprising how much bouquet there is in there. Although it's hardly what I would call "floral" - there is an unmistakable rose, jasmine and carnation at the heart, which really rounds it off. It's also surprising how sweet the base is, complete with vanillin and heliotropin. Really not what we've learned to consider "masculine" in our day and age. Drugstore fragrance or not - some things are simply priceless. The smell of my grandfather is one of them.